This is a very good deal for an ace Chad Valley girls’ outfit with a sweet little bee and star motif. Originally on sale for £9.99, this cute duo are now on sale for £2.99 which is substantially less than half price. You can, as always, click to collect for free instore. 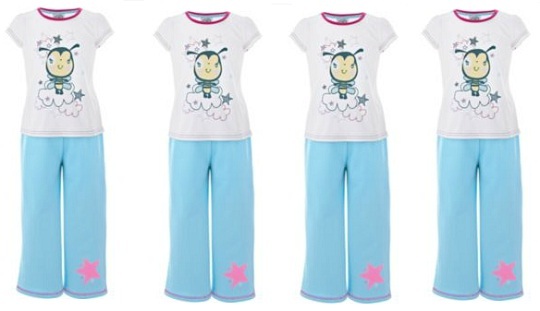 The Chad Valley Girl’s Bee Jogger and Tee set is available in a wide range of different sizes as part of this offer. You can choose from 12 months to five years old and the items are made from 60% cotton and 40% polyester. The top has a sweet little bee motif on it with a red outlined collar for emphasis. The jogger pants are a lovely light blue, a refreshing change from the pink that’s constantly forced on us, and have a pinky line and star embroidered at the base. I think this set is very sweet and the price is excellent too. Thanks to sparkylicious at HUKD!